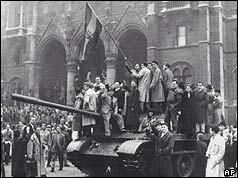 The Hungarian revolution brought tens of thousands of people onto the streets to demonstrate against Soviet oppression. Many were killed or wounded as the Soviets sent in tanks in a desperate attempt to crackdown on the uprising. Up to 200,000 people fled the country, which remained in Soviet hands until the collapse of communism in 1989. I was a student in the Agricultural University (AU) in Budapest, and was elected to represent AU in the University Revolutionary Council. I attended the nightly meetings of the Council at the Piarist School during the revolution. The normal food supply chain has broken down during the street-fighting. Most of the students of the AU returned home to the countryside and when they heard the need, they started to send truckloads of potatoes, chicken and other food to help. They thought the best place to send the food was to their university, and so I ended up receiving the trucks with food and helping to distribute the food in needy areas. So, I went to places in Budapest where the fighting had just ended, as these were the most needy places, and took many photographs of the battleground. I gave the film to a western journalist to take to Vienna, but he was caught by the Russians and the negatives taken from him. What a shame! I was there at the Council meetings, perhaps the last one, when we heard that the Russians were re-invading Budapest. We heard of the catastrophic decision to make war over the Suez Canal, and knew that the Hungarian cause was abandoned and lost. We more or less agreed at that sad meeting that those who are in danger should escape to Austria, but do not fight. It was hopeless now and we did not want our town destroyed by war as Korea was ruined. I was in Vienna for a few days during Christmas following the Hungarian revolt. Austria had accepted thousands of Hungarian escapees. Most of them had nothing. When I got on the train returning me to Geneva, I sat across from a Swiss couple who had come to Vienna to adopt an Hungarian child. The adopted boy was sitting with the couple. I was very moved that the couple had changed their lives to take in a lost child. The follow-up did not mention that the failure of the West to help the Hungarians ended the dreams of freedom for other countries behind the Iron Curtain. It was as massive a betrayal as Yalta, and it kept the countries occupied by Moscow for more than another three decades. My mother was only eight years old and lived in district 8 the middle of Budapest when the fighting broke out. She has very distinctive memories of watching the fighting, and screaming when my grandmother was nearly shot in the head as she tried to run across the road to find food. She was saved by ducking back under 'kapu' (gate) as the bullet lodged into the wall near her head. She remembers hundreds and hundreds of graves dug all through the city parks or wherever there was earth, including all the playgrounds. They were playing in the middle of freshly dug graves for years. My father lived just outside of Budapest and the whole town was waiting for the Russians with arms ready to die. What the media didn't report but my family and grandparents and family friends all verified was that the US dropped leaflets through the country a number of times singing the graces of the West. So in effect when the revolution was happening everybody thought the West would come to their aid and help, but of course no one did. On this day in 1956 I was serving in the US Army with a field artillery unit on routine practice manoeuvres near the Czech border. We had been out about a week and were scheduled to return to base when the news came of the uprising in Budapest. Rumors were spreading that we would have to stay in the field in case war broke out between the USSR and USA. We were to be a buffer between the rolling USSR tanks and the West. Needless to say, we had a few uneasy days contemplating the end of our lives. However, calm soon arrived instead. The crisis ended, at least for us. The Hungarians were in for many years of tyranny. In 1956, I was a young student. The Hungarian's strike for freedom made a deep impression on me. When I had a chance to visit the Great Country in 2003, I visited the memorial monument, on the left side of the square in front of the beautiful Parliament. Congratulations to all Hungarians - they have freedom today. I was six years old when the revolution occurred. I was visiting my father in Szeged, Hungary. My mother and brother were at that time in Budapest where I was born. We would listen to the speeches and news reports on the radio. I remember the day the Russian army entered Szeged. I had to hide in the ditch by the side of the road until all the tanks moved out of sight. It was cold and wet as it was late October and I got very ill after catching pneumonia from lying in the wet ditch. My father left the country via Yugoslavia shortly after the Russians came. He took me with him leaving behind my mother and younger brother. Thanks to the BBC for remembering the Hungarian revolution. We were fighting with almost bare hands against the Soviet tanks for our freedom, for our country. They destroyed part of cities, killed thousands but never could destroy our spirit for freedom. There are countries today, who are fighting for their liberty against the tanks of tyranny, but they cannot break the spirit, hope of freedom loving people. Thanks again. At that time I was only three years old, in Belgrade, Yugoslavia, but I clearly remember the fear my parents were showing many times a day claiming "we are next", or more poetically "the end is coming". Something evil and sinister was scaring me to death and I didn't even know what it was. It was only after the Russian "intervention in Czechoslovakia" that I learned what was it, that had frightened me 12, 13 years before. The Hungarian revolt is the first thing I remember reading in the newspapers when I was eight years old. I have always been disappointed that our American government didn't do anything to help them become free.